To view our current inventory of antique and vintage binnacles and compasses, click here! 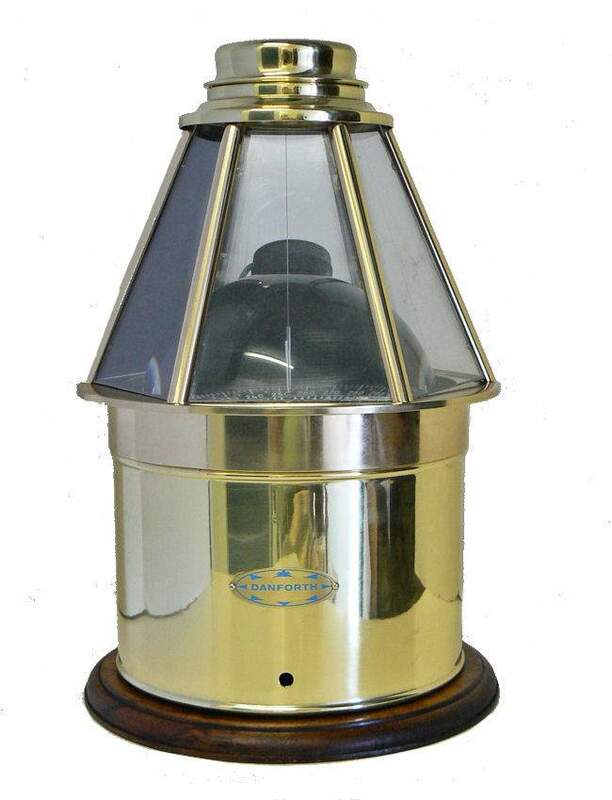 This Fine Skylight Binnacle Has Been Sold. Thank you! 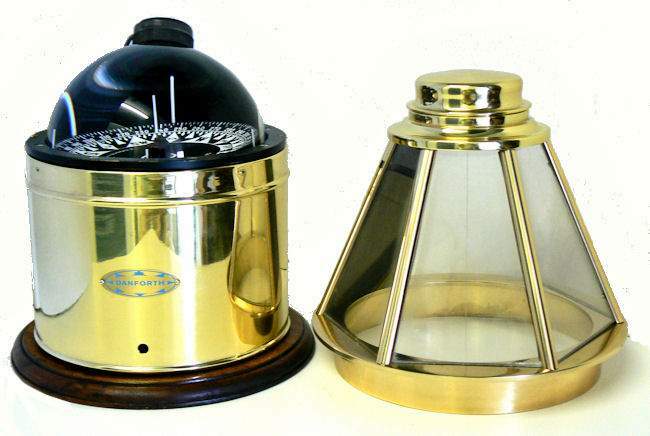 PRESENTED is a larger than normal Danforth skylight or cathedral binnacle with a Constellation compass. It was made under the “Danforth - White” brand name, and discontinued after approximately 15 years from when the Wilfrid O. White Company was acquired in 1961. It is in the preferred brass finish with six panels, and has a spherical compass which was the invention of White. Two of the panels have etched vertical lines to allow for taking bearings, and one is a black filter to be sighted through when taking amplitudes of the sun. It is mounted on an vintage wood base, and is about 3 inches taller than the PERKO make which we recently sold. Danforth ceased making compasses in December, 2009. Binnacles such as these became very popular starting in the 1920's. Their popularity may have increased after one was seen aboard the motor vessel "Santana" in the movie "Key Largo" (1948) staring Humphrey Bogart and Lauren Bacall. Bogie also had one in the cockpit of his famous yawl Santana. Here it is shown covered with a chrome hood. And for those interested, I insisted on having one on our ketch Bagheera which served us well during seven years of ocean cruising. PERKO discontinued making them about 1954, and Ritchie did the same. 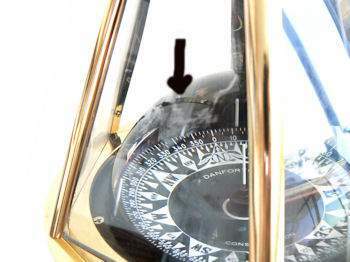 The only source of skylight binnacles until recently was from Danforth priced at $3400.00, but they discontinued compass production in 2009. CONDITION: After all these years, the condition is exceptional, and everything is almost in "like new" condition. The only fault is that the panes are made from Plexiglas and show some scratches from polishing the brass up rights. It is equipped with an electric connection for the compass' light. 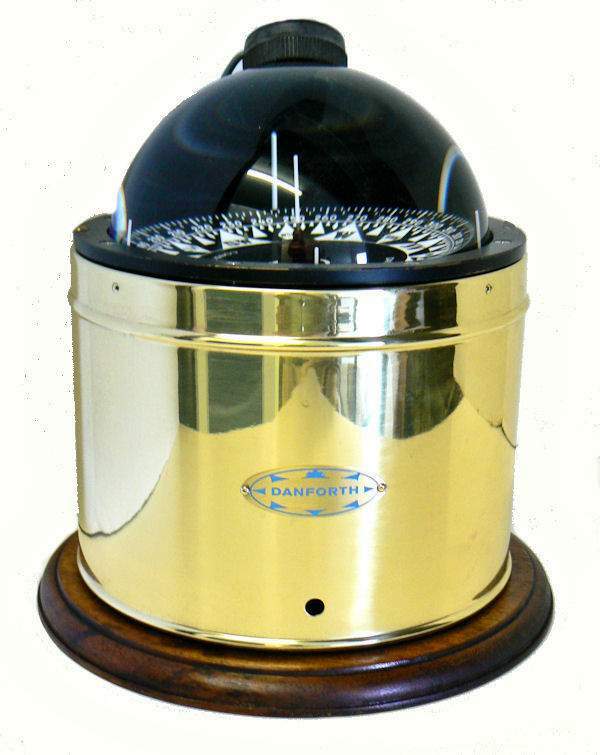 The compass has been rebuilt, and the binnacle has just been professionally polished and lacquered for your enjoyment. Diameter of Constellation compass card 5" Diameter of compass 6"
PROVENANCE & BRIEF HISTORY: Wilfred O. White had a rich nautical family history, descending from a shipbuilding family that dated back to 1600 England. Born in Melbourne Australia, White came to the United States in 1898 and married Ruth Eldridge, the daughter of George Eldridge, who charted the first tide and current tables in U.S.
White had studied with the Scottish Lord Kelvin of compass fame for a year or more in Glasgow in the very early 1900's. Kelvin's work on magnetic compasses goes back to 1870, and the result was quickly adopted by the world's navies. After Kelvin's death in 1907, White was chosen to be Kevin's exclusive agent in the United States by Kelvin's successors and partners, Kelvin, Bottomley & Baird. The Kelvin & Wilfrid O. White and Co. commenced operations in 1918. White, reportedly, had to pay LIST price, in advance with his orders. This became a thorn in Wilfred's side, and it ultimately lead him to develop his own design improvements which were marketed under the Kelvin - Wilfrid O. White brand. He is said to have invented the spherical compass in the 1940;s and his son Wilfrid Gordon later improved upon it's design. The Wilfrid White company sold out to the Eastern Company which consolidated it operations with Danforth's Marine Hardware, first in Naugatuck, CT and then moved the Danforth- White Division to Portland, ME in 1961. Compasses continue to be produced under the Danforth - White label. 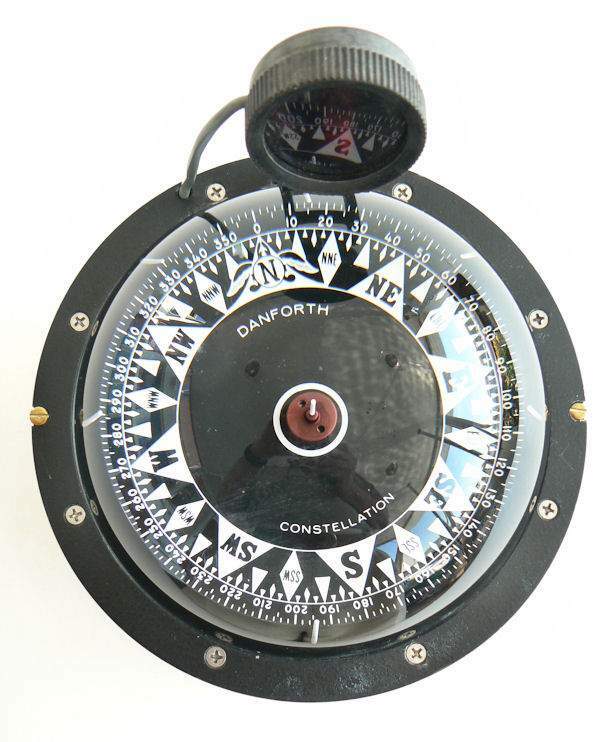 In the 1970's Danforth dropped the Danforth - White brand and marketed their compasses as Danforth. In 2009, Danforth ceased compass production entirely so this example shall become more valuable as time goes on. 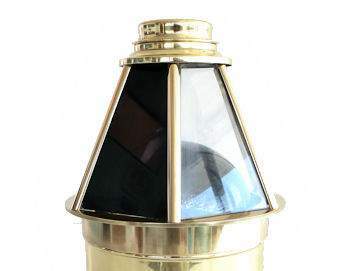 This rare Skylight or Cathedral binnacle is ready to go back to sea or it is suitable as a gift or as an addition to any collection of fine marine artifacts. International buyers welcome, but should inquire first. We have satisfied customers in Argentina, Australia, Austria, Belgium, Bermuda, British Virgin Islands, Canada, Chile, China, Czech Republic, Democratic Republic of Congo, Denmark, Estonia, England, France, Germany, Greece, Holland, Hong Kong, Hungary, Iceland, Indonesia, Ireland, Israel, Italy, Japan, Kuwait, Latvia, Malaysia, Martinique, Mexico, Nigeria, New Zealand, Norway, Nova Scotia, Panama, Poland, Portugal, Puerto Rico, Romania, Saudi Arabia, Scotland, Singapore, Spain, Sweden, Switzerland, Thailand, Turkey, United Arab Emirates, USVI and the Eastern Caribbean.